We are a contract manufacturer of deep draw metal stampings. Take some time to explore our pages and our processes, or if you are in a hurry for some answers, let’s begin the discussion right now! We are a business driven by talented deep draw tool and die makers dedicated to getting you the right part at the right time at the right cost. And we’ve been getting it right for 69 years this year. We are a small manufacturer with big customers and a global reach far from our home in Connecticut. Our size works to your advantage. You have access to any of our management team members. We will quote your project within forty – eight hours. Our engineers and toolmakers will assist you with your design dimensions and deep draw forming capabilities. We will remain in close contact with you throughout the tool building process in order to maintain the delivery date you need. Deep draw forming is noted for its cost savings in material consumption and the elimination of post-production secondary operations. 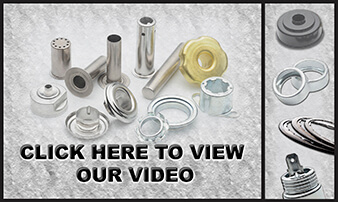 Savings like these have prompted some of our customers to convert some of their more expensive machined, cast, or tube components to the deep draw process. In fact, we share a patent for one of the redesigns. Prospect Machine Products is ISO 9001:2015 certified. PMP’s deep draw metal forming skills consistently meet or exceed customer expectations in North and South America, Europe, and Asia. Thanks for the visit, come back soon, and contact us to start your deep draw metal stamping project!